Compte rendu publié dans Acta fabula (Février 2018, vol. 19, n°2) : "Dossier : Le Moyen Âge pour laboratoire": Vanessa Obry, "Chrétien de Troyes pluriel"
Woodbridge, D.S. Brewer, coll. « Gallica », 2011, 202 p.
This co-written, multi-stranded book challenges assumptions about Chrétien as the author of a canon of works. In a series of lively exchanges, its five authors reassess the relationship between lyric and romance, between individuality and social conditions, and between psychology and medieval philosophy. The idea of "logical time" is used to open up such topics as adventure, memory, imagination, and textual variation. Recent research on Troyes and on the political agency of women leads to the reappraisal of subjectivity and gender. Throughout, the medieval texts associated with the name of Chrétien are highlighted as sites where thought emerges; the implications of this thought are historicized and further conceptualized with the help of recent theoretical works, including those of Lacan. 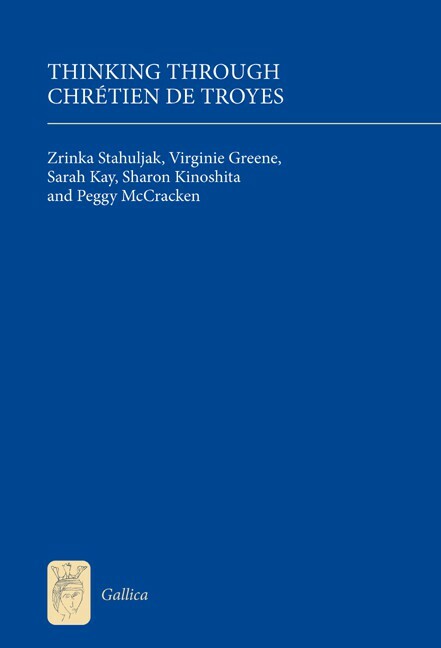 ZRINKA STAHULJAK, VIRGINIE GREENE, SARAH KAY, SHARON KINOSHITA and PEGGY McCRACKEN are professors at the University of California, Los Angeles, Harvard, New York University, the University of California, Santa Cruz and the University of Michigan respectively.